Nicole's Needlework: Sorry I've been MIA! I've been working on another model for The Primitive Needle. I've been stitching as fast as I can because Lisa would like to release it at the Nashville Market in February. Before I started stitching the model, I finished block 6 of CaHRH. Well, almost finished. I realized I forgot to fill in one of the stars in the sky. Oops! Gorgeous Block 6 Nicole! Congrats! Gorgeous work on block 6. I know what you mean about big projects! I love 'em, but when will I find time to stitch them all. I love love love Block 6! And I can't wait to see the new Primitive Needle releases. Your Ann Grimshaw is going to be going...love those silks! Nicole, I'm playing catch-up today, and you've been so busy. AG will be beautiful. The fabric and fiber you picked out are perfect. Of course you can stitch ATS. If a slowpoke like me can do it, a speedy gal like you certainly can. Christmas at HRH is looking great. Don't you love the way the fire looks on that block? And I'll be cheering you on from the sidelines on Quaker Fridays. Welcome back! Welcome back Nicole! Block 6 is just beautiful and I look forward to seeing your Quaker in progress. You are coming right along on CaHRH. I have a question.. how did you figure out where to start on such a big project? Do you start 2 inches in from the top edge? Thanks! Quaker Friday...now that sounds like a lot of fun!! great finish on another block. Your CaHRH is beautiful! I love the little skaters - they're so cute with their scarves waving in the wind. Perfect fabric and thread choice for Ann Grimshaw. I am fighting the urge to give in to Quaker Fridays!I think I have enough large projects, then again what is one more. 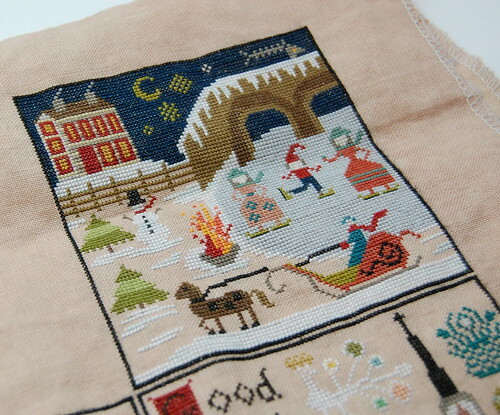 It was a pleasure to discover your blog and see so many gorgeous embroideries. Georgous looking block 6 ! Wow, you're stitching something for Lisa? How exciting! I hope we will get a sneak peek from Lisa soon. Your CaHRH block is great! I love the colors in block 6 of CaHRH! Every time I see your progress, I want to start on mine! Beautiful block, Nicole. Can't wait to see the PN piece and will certainly enjoy watching your Quaker Friday SAL! Block 6 is beautiful! Congrats. I'm starting to think I should buy this pattern. It's so colorful. Beautiful, Nicole!! You are making short work of this--YGG! I love your fabric & fiber choice for Ann. It'll be a wonderful rendition of Ann's sampler. How exciting to be stitching on a yet to be released model! How did you get that job? 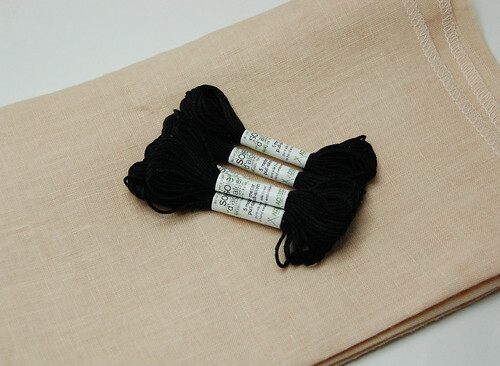 Ack... every time I see a progress snap of your CaHRH I want to run out and buy the chart,linen and fibers and start stitching my own sampler. It looks wonderful. Block 6 is a beauty! And if you''ve finished Block 6, does that mean you've passed the halfway mark? Wow. I'm impressed. I absolutely love your CaHRH, it's so pretty. And the Ann Grimshaw colors are gorgeous too. What a great block and I love your choices for Quaker Friday.